The Wildcats have held the title as the top team in the nation for three weeks straight now, and received 56 out of the possible 65 first place votes. They show no sign of giving up that position without a fight. With an 11-0 record, ‘Nova has managed to best every opponent it has seen since winning the Big Dance this past spring. During this hot start, the ‘Cats went undefeated in the Philadelphia Big 5 for the fourth year in a row. While Josh Hart, Kris Jenkins, and Darryl Reynolds become the first class ever in program history to finish their careers undefeated against Big 5 opponents, the historic achievement–while impressive–pales in comparison to the bigger goals they’re chasing after. Pending the American University game, the Wildcats have an opportunity to begin conference play undefeated, which their conference brethren, Creighton, has chance to do so as well. Lately, the entire Big East conference has been proving that its teams have what it takes to make it in college basketball this year. This past Saturday, all seven teams that played, won–Butler, Creighton, DePaul, Georgetown, Providence, Seton Hall and Xavier. 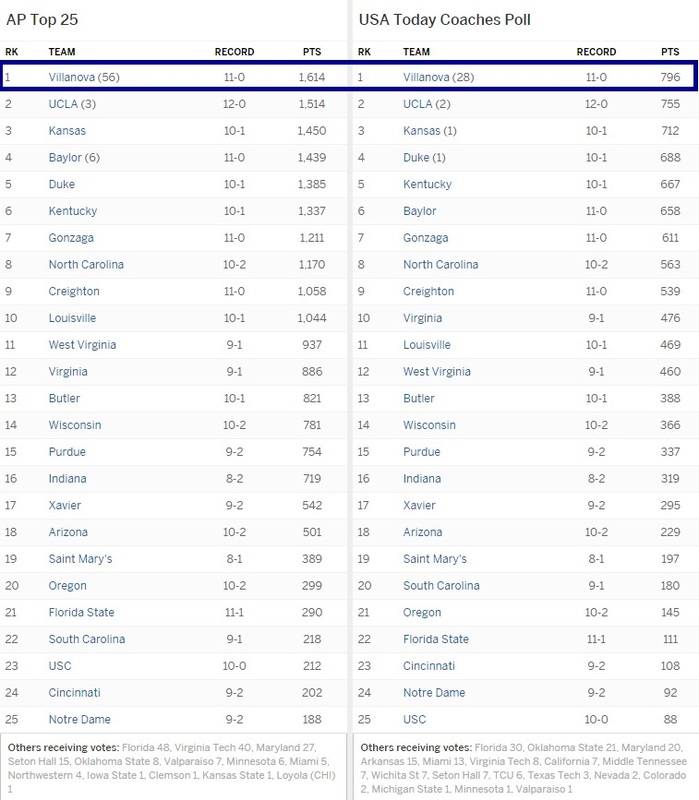 The Big East has four teams in the top 25: Villanova (1), Creighton (9), Butler (13), and Xavier (17). As they start to play each other, the season will be getting more and more exciting–and that top spot on the list will become harder and harder to defend. « State of the Nova Nation: Big 5 Four-Peat, ESPN Coverage of Villanova, Rollie Massimino Gets Win #800, & More!